1. Will give you access to the Dashboard, where you can manage settings and reviews. 2. Allows you to pick a display mode, either Light or Dark. 3. Show Summary, either toggle off/on, this will hide/show the summary graphic above the reviews. 4. Allows you to set an initial amount of reviews that will be visible, if there are more reviews available, a read more link will automatically be appended after the last review. 5. 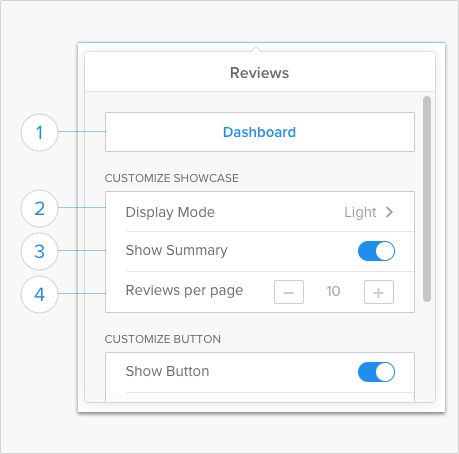 Show Button, toggling off this will hide the 'Write Review' button, this way only buyers from your site will be allowed to leave reviews. 6. 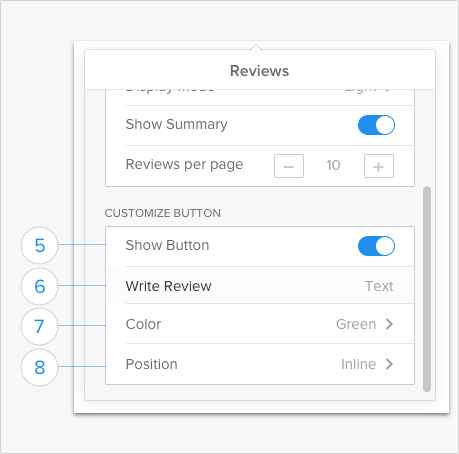 'Write Review', button text that can be modified as needed. 7. Color of the button is either green or white. Enable emails, will allow buyers on your site to receive an automated email that will ask them to leave a review about their specific purchase. You can set the amount of days after the purchase was made when this email should be sent out to your client. When emails will be sent out you have the option of specifying your company name, which will be the senders name as well as include a logo of your company which will be visible in the email sent out. 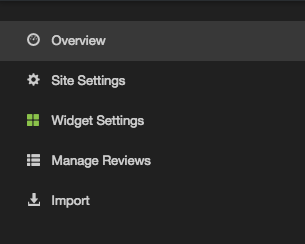 In the Widget Settings you can choose wether the reviews are already being displayed among all the reviews made on your site, if this has been toggled off, they are being recollected but not being displayed. This can later always be turned on.